A 46 year old gentleman presented with pancytopenia and histoplasmosis infection on esophageal biopsy. A bone marrow biopsy was performed. The core biopsy showed a hypocellular marrow with prominent gelatinous transformation (serous fat atrophy). 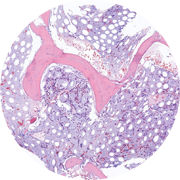 Areas of the core biopsy showed complete loss of hematopoietic elements and mild plasmacytosis with polytypic immunophenotype. Special studies on GMS and AFB were negative in the marrow. Serous fat atrophy within the bone marrow may be linked to malnutrition, cachexia, and infection such as acquired immunodeficiency syndrome (AIDS). This information was communicated with the clinicians. The patient was found to be HIV positive by laboratory studies.